Keep calm and carry on. FX has renewed Ryan Murphy’s Feud TV show for a second season, ahead of the March 5th season one premiere. While the first season focuses on the rivalry between movies stars Bette Davis (Susan Sarandon) and Joan Crawford (Jessica Lange), Feud season two will center on Prince Charles and the late Princess Diana. The Feud season one cast also includes Alfred Molina, Stanley Tucci, Judy Davis, Jackie Hoffman, Alison Wright, Dominic Burgess, Catherine Zeta-Jones, Sarah Paulson, Kathy Bates, and Kiernan Shipka. Murphy will write Feud: Charles and Diana with Jon Robin Baitz. In addition, the duo will executive produce with Dede Gardner, Plan B Entertainment, and Alexis Martin Woodall. Learn more about the Feud season two renewal from this FX press release. LOS ANGELES, February 28, 2017 – Award-winning producer Ryan Murphy’s highly anticipated new anthology limited series FEUD: Bette and Joan does not premiere until this Sunday, March 5, but FX announced today that is has already placed a 10-episode order for the second installment of the FEUD franchise, FEUD: Charles and Diana, which is scheduled to debut in 2018. Murphy and Jon Robin Baitz will write FEUD: Charles and Diana and serve as Executive Producers. Dede Gardner, Plan B Entertainment and Alexis Martin Woodall are Executive Producers. The limited series is produced by Fox 21 Television Studios. Ryan Murphy is the Emmy and Golden Globe award-winning writer, producer and director who pioneered the modern anthological limited series with award-winning hit American Horror Story, which is now heading into its seventh year and has been ordered through season nine. American Crime Story, his most recent anthology franchise, debuted in February of 2016 and its first installment, The People v. O.J. Simpson: American Crime Story, won the Emmy and Golden Globe award for best limited series and it was the highest-rated show in FX history. Previously, Murphy co-created of the award-winning hit musical comedy series Glee (FOX) and created the award-winning hit drama Nip/Tuck (FX). Jon Robin Baitz is currently a consulting producer on Katrina: American Crime Story for FX. Previously he created Brothers & Sisters (ABC), was an executive producer on the mini-series The Slap (NBC), the Humanitas Prize winning Three Hotels (PBS), as well as episodes of The West Wing (NBC) and Alias (ABC). Murphy, Baitz, Gardner and Plan B are represented by CAA. FEUD: Bette and Joan, the eight episode first installment of the FEUD franchise, premieres this Sunday, March 5 at 10 PM ET/PT on FX. It tells the story of the legendary rivalry between Joan Crawford (Jessica Lange) and Bette Davis (Susan Sarandon) during their collaboration on the Academy Award®-nominated thriller What Ever Happened to Baby Jane? and well after the cameras stopped rolling. The series explores how the two women endured ageism, sexism, and misogyny while struggling to hang on to success and fame in the twilight of their careers. In addition to Academy Award winners Lange and Sarandon, the cast includes Alfred Molina as the film’s director Robert Aldrich, Stanley Tucci as studio titan Jack Warner, Judy Davis as gossip columnist Hedda Hopper, Jackie Hoffman as Crawford’s housekeeper Mamacita, and Alison Wright as Aldrich’s assistant Pauline. Notable guest stars include Dominic Burgess as Crawford and Davis’ co-star Victor Buono, Catherine Zeta-Jones as film star Olivia de Havilland, Sarah Paulson as Geraldine Page, Kathy Bates as Joan Blondell and Kiernan Shipka as B.D., Bette Davis’ daughter. FEUD: Bette and Joan is created by Ryan Murphy and Jaffe Cohen & Michael Zam. Ryan Murphy serves as Executive Producer along with Executive Producers Dede Gardner and Plan B Entertainment, Tim Minear and Alexis Martin Woodall. The series is produced by Fox 21 Television Studios. What do you think? Do you plan to watch the first season of the Feud TV show? Will you tune in for the Charles and Diana installment, in 2018? 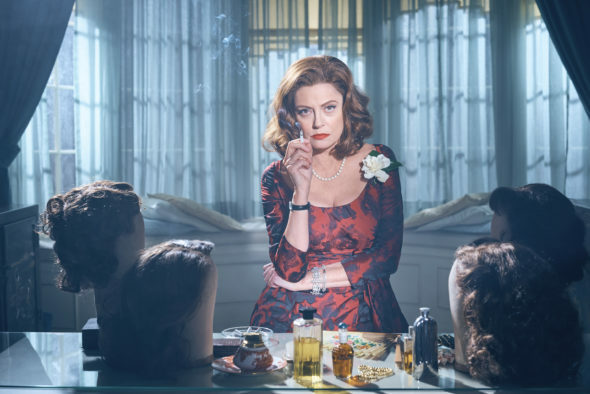 More about: Feud, Feud: canceled or renewed?, FX TV shows: canceled or renewed? I loved Season One, I thought a great follow up would be Olivia De Haviland and Joan Fontaine. This feud has already been mentioned in Season One. Charles and Diana have been through the press and portrayed too many times…not sure I will tune in. As usual, the shows made by the well-connected get “renewed” before they started. It’s a lot less embarrassing than waiting for the bad ratings.